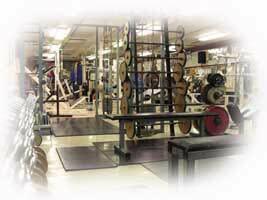 When You Walk Into a Gym, What is the 1st Thing You See? A sea of gym equipment is usually the first thing which catches your eye. Walking into the gym for the first time can be overwhelming and even intimidating for some people. 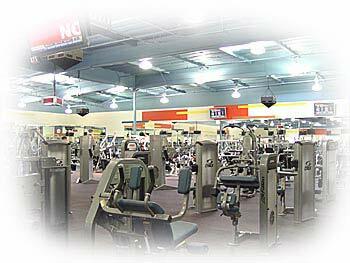 Most gyms are big, filled with different kinds of people, and of course a sea of gym equipment. The vast majority of gym members would cite the exercise equipment as the reason why they have a gym membership. This is the reason why most gyms have so much equipment. Someone with little knowledge about exercise and fitness who is considering to become a member, a large amount of exercise equipment may look like a good reason to join. If you are a seasoned gym veteran these points may be obvious to you, but they are very important to help people who are new to the gym. The average gym member is just that, average. Even bodybuilding gyms are now filled with mostly middle-aged men or women trying to tone up or shed some weight. Bodybuilders make up a very small percentage of gym members. 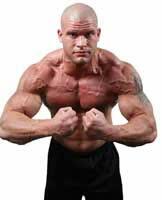 Even bodybuilders may appear intimidating they are usually the nicest people in the gym and would be eager to help you out if you had any questions about gym equipment or exercise. When you go to your local gym you may feel pressure to join from the membership counselors. You may be pressured to get extra services such as personal training. Personal training is a great investment provided you have a good personal trainer, but if you cannot afford it, you cannot afford it. You do not need to have a gym membership to lose weight, gain muscle or become fit. If having a gym membership means you will not be able to afford healthy food, you are better off working out at home or outside. Your local gym has so much exercise equipment for one reason and one reason only. To make money. As mentioned before, when someone walks into the gym for the first time the first thing they see is the exercise equipment. This equipment is how a gym sells memberships. The gym is banking on the fact that over 75% of gym members drop out within the first 3 months. People pay, then stop using the gym for a number of reasons such as not getting results and even becoming overwhelmed with the amount of gym equipment and not knowing what to do. This is not to say that all the gym equipment is worthless but definitely not necessary. Next is a rundown of the different types of gym equipment including where to buy them, how to use them and their benefits. Which Different Types of Equipment are in the Gym? Gym equipment is designed for home and commercial use. The primary difference between commercial and home gym equipment is the durability. Commercial gym equipment has to go through heavy use from many gym members throughout all hours of the day. It is more expensive and higher quality than home gym equipment but has the same use. Free weights allow free range of motion in any plane of motion, for exercises which involve any muscle groups. Free weights is the generic term which refers to the combination of dumbbells and barbells. Barbells are long bars with weight plates on the outside. There are a few different sizes and types of barbells. In your gym you will most likely find Olympic bars which are adjustable by adding plates and fixed barbells (above) which are a set weight. Adjustable barbells have no torque because the ends rotate while fixed bars create torque because there is no rotation about the ends. Olympic barbells weight 20kg which Americans call 45 pounds. The plates used for Olympic barbells which can support well over 450kg or 1000 pounds have 2 inch diameter holes. Benefits of Barbell Weight Training: Barbells allow you to use heavy weights for the best mass and strength building exercises. Weight plates are added to barbells for extra resistance. Weight plates are gym equipment which no gym is without. Weight plates come in many sizes, shapes and weights but there are 2 primary differences. Standard Olympic plates (left) have a 2 inch hole which slips around the end of the barbell. 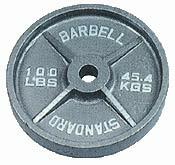 There are many different styles of weights such as plates with handles, holes and grips but the weight is the same for all of them and comes in 45lbs, 35lbs, 25lbs, 10lbs, 5lbs and 2.5lbs. Weight plates come in different colors and materials as well. You will find rubber coated, chrome and urethane coated weights which are the most expensive and longest lasting. Olympic bumper plates (right) are brightly colored and coated in rubber. You are unlikely to see these in most gyms as they are primarily for Olympic lifting in which they have to bounce off the floor when dropped from high positions such as above the head. Olympic plates come in the following standard weights across the entire world. Red 25kg (55lbs. ), blue 20kg (44lbs. ), yellow 15kg (33lbs. ), green 10kg (22lbs.) and there are black training plates and silver small plates of various weights to create different weights for competitions. Which Weight Plates to Choose: Olympic bumper plates are not necessary if there is no Olympic lifting which is the case in 90% of gyms. The rubber covered plates tend to chip easily. The urethane coated plates are by far the best but expensive. Handles on weight plates can be useful because they allow easier grip and make the plates more versatile to use for exercises alone. When choosing a plate set it is best to buy from a reputable brand which has been created top notch gym equipment for a long time such as Ivanko and Troy. Dumbbells are a small bar with round fixed or adjustable plates. The dumbbells you will find in most gyms have fixed plates which are adjustable but only tightened every so often with a hex wrench. You will find dumbbells in your gym in many different forms. There are dumbbells with round (left) edges as well as dumbbells with hexagonal edges (right). The benefits of dumbbells make them be the must-have piece of gym equipment for all gyms. Benefits of Dumbbell Weight Training: Dumbbells are a true free weight because they allow the user to perform motion in all planes. Dumbbells are the best way to build functional strength, muscle, tone up and lose weight in a complete weight training program or other workout routines. Russian kettlebells are less traditional gym equipment in America. Kettlebells were supposedly used by Russians of the Soviet Union for training which resulted in their Olympic prowess. 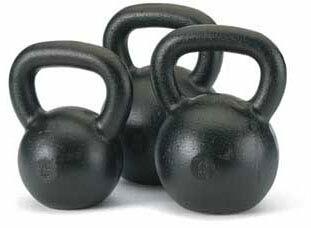 Kettlebells come in different forms such as the classic iron and rubber coated. Kettlebells have little use in the average gym because the exercises are unfamiliar with most. Benefits of Kettlebell Training: Kettlebells are great to use for developing functional strength and power. If you want to have a set of Russian kettlebells in your gym or simply want to use them, there are many courses available to learn proper technique and it is recommended you take advantage of them. Many exercises for dumbbells and barbells performed on a weight bench. There are many different types of weight benches. 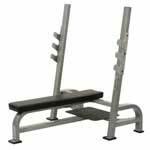 There is flat, decline and incline weight benches. Some are adjustable (left) and some are fixed. Weight benches also are attached to barbell racks for exercises such as bench press (right). The sturdier the better for weight benches as they allow for a multitude of safe body weight as well as heavy barbell and dumbbell exercises. How to Choose a Weight Bench: Think sturdy. You don’t want the bench to be wobbly while your doing dumbbell chest press with 100lb dumbbells or weighted step ups. If you want a single weight bench, make sure it adjusts to decline and incline angles to make the most effective variety of exercises possible. Cables refer to any exercise equipment with adjustable cables which allow you to perform many different motions. Cable set-ups involve a weight stack at one end, through a set of pulleys which ends up with a carabineer attachment for a handle, rope, or bar. You pull the cable which lifts the amount of weight you select on the weight stack. 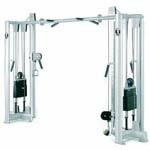 The lat pull down is a high fixed cable which is a staple in 99% of gyms. The lat pull down also has a seat with roller pads to hold your legs down. The roller pads are only necessary if you are lifting more than your body weight. The top of the lat pull down has a carabineer which allows different attachments. You can perform any exercise which you would use a high cable for on the lat pull down. The weight on a lat pull down machine stack is the actual weight you will be lifting because of the single pulley set-up. Since there is no lower pulley, you have no mechanical advantage hence you lift what you select. Benefits of Lat Pull Down: Lat pull down is an important exercise for anyone who cannot do high numbers of pull-ups. They work a major muscle group and every medium to large sized fitness center should have a lat pull down in their line of gym equipment. The lat pull down is also good for triceps extensions but the weight will be heavy and it won’t work as well as the cable crossover, free motion, or any machine with a dual pulley ratio. The cable crossover takes up a lot of space and will appear to be the centerpiece of many gyms. The cable cross over is a tremendous piece of equipment to have in any gym. They will sometimes be equipped with seated rows and lat pull down set-ups on each side in larger gyms. The cable cross over consists of two adjustable height dual pulley cables. They are usually separated with an overhead bar which has a pull-up attachment. Since there is an upper and lower pulley on each weight stack, the weights move around half of the distance of the length of cable you pull. This means if you have the weight stack set at 100 pounds you will only be lifting around 50 pounds due to the mechanical advantage provided by the dual pulleys. This gives you smoother movement than a single pulley system such as the lat pull down. Benefits of Cable Cross Over: Every gym with the required space must have a cable cross over. The entire body can be exercised with this very versatile piece of exercise equipment. The only drawback to the cable cross over is the huge amount of cubic space it takes up. If space is a concern then the free motion (below) is the best option. Free motion machines are the name of a brand which originated in the 1990s. These machines are taking over the cable crossover as the most useful exercise equipment to have in the gym. A free motion dual cable cross combines everything that the cable cross over can do, and does it in about a quarter of the space. Like the cable cross over there is a dual pulley ratio which creates a smooth resistance. The arms have multiple adjustments which enable the free motion dual cable cross (left) to accommodate for almost an infinite number of exercises for people of all sizes and fitness levels. The price the free motion equipment will affect the cost. Home versions are cheaper than the commercial version. There are other pieces of free motion equipment meant for isolated muscle groups but the dual cable cross can do pretty much everything. Benefits of Free Motion Equipment: The dual cable across (above left) is one of the very best piece of gym equipment to have in a home gym or giant fitness center. Free motion equipment is a great addition to free weights in which the combination offers an unlimited variety of exercises. Weight machines make up the bulk of the sea of gym equipment which you see when entering most gyms. There is an ongoing battle of “free weights vs. machines” which has been going on for years. Which is more effective? They are both effective but free weights are more effective when performed properly. Machines take out much of the improper form associated with free weight exercises but have other problems. In the past it was thought that people should start on machines and progress to free weights but current research has shown the contrary. Since weight machines control the motion completely usually through a single plane of motion, the body’s important stabilizer muscles do not get recruited. Weight machines were designed to isolate a muscle group, therefore they are best used for muscle building. Machines provide far less functional strengthening benefits than free weights or free motion exercise equipment. 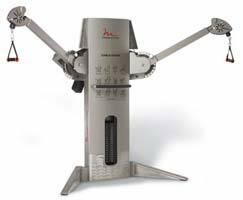 Selectorized weight machines or “machines” are generally designed for one specific motion. Selectorized refers to the adjustments of the machine. There is a pin which you can pull out and insert at any weight which you want to lift. Each machine also has various adjustments such as seat height or handles which you also select to adjust the machine to fit your body size. After you adjust most machines, you sit down and pull, or push the handles to lift the weight stack which attached through to a cable which usually runs through a complex looking pulley matrix. There are many different styles and brands of weight machines for every body part. 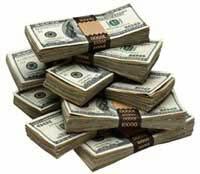 The cost of weight machines almost entirely depends on their weight. Since you are paying for a hunk of steel the bigger it is, the more you pay. There are some machines with complex features which don’t change the cost as much as you would think. Benefits of Selectorized Weight Machines: Weight machines are great for isolating muscle groups for bodybuilders or anybody looking to build a specific muscle. If someone is to begin weight training with no instruction, selectorized weight machines may be the best way to go. Hammer strength is a brand of exercise equipment which has been creating weight machines for years. Hammer strength machines are mostly plate loaded instead of relying on cables and pulleys. Standard Olympic plates with 2 inch holes are used. Most hammer strength machines have weight racks attached for plate storage. Being plate loaded, hammer strength machines feel more like free weights. Hammer strength machines are weights because the motion is still fixed although the motion of many hammer strength machines. Benefits of Hammer Strength Weight Machines: Hammer strength weight machines allow the bodybuilder or fitness enthusiast to target and isolate muscle groups through 2 planes of motion. Hammer strength machines are popular amongst strength trainers who enjoy lifting heavy weights as they consider hammer strength machines to “feel” more like free weights. Where Can I Find the Best Prices for Gym Equipment Online ? Buying gym equipment online is superior than going to the store because you order will be shipped to your door. You do not have to rent a truck, clean out your trunk, or dangerously tie the exercise equipment to the top of your small car. Large pieces of equipment are even put together for you saving a huge hassle. Amazon.com is the world’s largest retailer. You can find plentiful new, used and refurbished pieces of exercise equipment from the most trusted online retailer in the world. Big fitness is one of the largest online vendors devoted solely to exercise equipment which means you will be able to pick and choose which gym equipment meets your needs. BigFitness specializes in home and commercial gym equipment. Find reviews of fitness equipment ranging from cheap weight training home gyms and cardio machines to high end quality fitness products intended for commercial gym use. Equipment which will help you get better workouts at home. You can use home gym equipment if you are going to create a home gym or simply want to find out which exercise equipment is best for home use. You may be surprised that some of the best home gym equipment is not very expensive, takes up very little space and helps you achieve fabulous results. You will find a plentiful supply of cardio machines at your local gym or fitness center. Although created for the same general purpose, all cardio machines have something unique about them. A fitness center cannot be complete without multiple cardio machines. 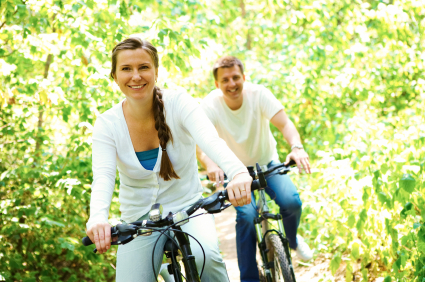 If you do not enjoy running, bicycling, hiking, sports or other outdoor cardio activities cardio machines may be your home gym equipment of choice. Review of the popular Schwinn Airdyne Bike cardio machine which can the best gym equipment for the average person just getting into fitness. The Gazelle Edge is a low cost piece of home exercise equipment developed by Tony Little that offers a low-impact in-home workout for weight loss, muscle toning, and cardiovascular exercise.